The Department of Mathematical Sciences is the largest department at Indiana University-Purdue University Indianapolis (IUPUI). 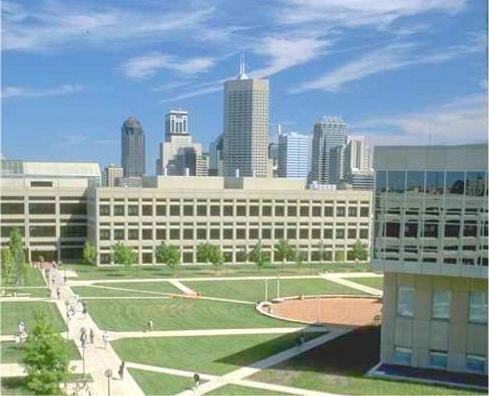 IUPUI was founded in 1969 and has rapidly grown to become a comprehensive university with degrees at all levels in all of the disciplines offered at Indiana University and Purdue University combined. There are half a dozen large hospitals, and the Indiana University Schools of Medicine, Dentistry, and Nursing, located at the IUPUI campus, leading to a major focus at IUPUI on the medical and health sciences. The Department of Mathematical Sciences has over 50 faculty members teaching and conducting research. There are groups in Pure Mathematics, Applied Mathematics, and Statistics. The Department has an Undergraduate Program and a Graduate Program. The Undergraduate Program includes concentrations in Pure Mathematics, Applied Mathematics, Actuarial Sciences, and Applied Statistics (in development). There are currently 120 undergraduate majors. The Graduate Program has Ph.D. degrees in Applied Mathematics and Pure Mathematics, and M.S. Degrees in Applied Statistics and Mathematics Education. There are currently 40 Ph.D. students and 50 M.S. students. The Statistics Group also maintains an active Statistics Consulting Center (SCC). The SCC provides consultation, collaboration, and educational outreach to all IUPUI researchers and other non-university clients including local governments. The SCC also leads to a synergistic environment for training graduate students in the art of statistical consulting: identifying research problems with high utility to applied investigators, and finding practical examples for teaching and testing.